Here are some facts about Louis Pasteur. Louis Pasteur was a French biologist and chemist. He is best known for his research into the cause and prevention of various diseases, as well as finding vaccines for anthrax and rabies. He was born in Dole, France in December 1822. Before becoming interested in science, Pasteur studied painting and drawing. He taught at a school in Dijon and in 1848 became professor of chemistry at Strasbourg University. He married the daughter of the university’s principal, in 1849. They had 5 children, although 3 died at an early age and these losses were partly responsible for Pasteur becoming a scientist. Louis Pasteur realized that tiny organisms, known as germs, carry bacteria and cause disease. He helped the silk industry, by realising that microbes were destroying silkworms. Louis Pasteur came up with the idea that a person must either be left or right handed. He was a devout Catholic. He invented the process of pasteurization, which is widely used today for milk and beer. The rapid heating process, which kills harmful germs, still bears his name. Pasteur invented the rabies vaccine after treating a boy bitten by a dog, and also came up with the word ‘vaccination’. He also devised vaccines for tuberculosis, cholera and yellow fever. He was afraid of catching diseases from people and would never shake anyone’s hand. He also encouraged doctors to sanitize their equipment and wash their hands before surgery. Pasteur was honoured by the London Royal Society and the French Academy of Sciences. He was awarded the Grand Cross of the Legion of Honor, one of only 75 French citizens to receive the award. 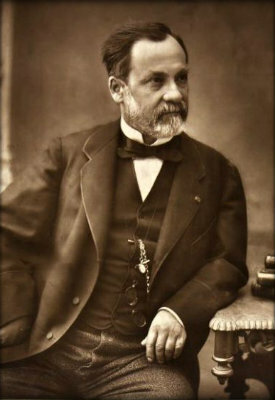 Louis Pasteur died in 1895 from a stroke. He is buried in the Pasteur Institute in Paris, and his crypt is engraved with some of his research and findings. What next? Learn more about Robert Koch and Joseph Lister, two other scientists who worked during the reign of Queen Victoria.